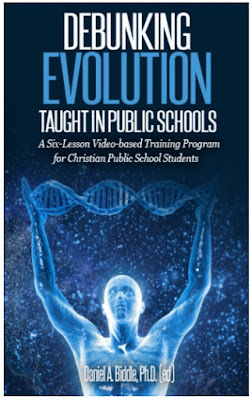 When I obtained the free PDF download of Debunking Evolution Taught in Public Schools, with the subtitle, "A Six-Lesson Video-based Training Program for Christian Public School Students", I didn't expect much. After all, there's a heap of books, articles, videos, and so on with similar names, and I had heard of neither Genesis Apologetics nor editor and author Dr. Daniel A. Biddle. (Which is fine, they've probably never heard of me or Piltdown Superman, either.) So, I converted the PDF to my e-book reader's format. Glad I was mighty wrong about my initial reaction! Turns out that the PDF version of the book is not only available free on the Genesis Apologetics Website, but you can buy it in paperback as well as Epub and Kindle versions. Debunking Evolution Taught in Public Schools is primarily intended for students in the public indoctrination centers. They are presented with sanitized "evidence" for evolution, including speculations, "maybe", "scientists think", "perhaps", cherry-picked data, incomplete information (contrary data are conveniently omitted), and even outright falsehoods. Creation science ministries counter these things with evidence that anti-creationists do not want you to know, and this book gives material that counters several important areas that are presented by biased secularists. The 2016 version (that's right, they're letting us download the latest edition) is 356 pages (my PDF says 355, no big deal). It has 11 authors including Dr. Biddle, Dr. Jerry Bergman, Dr. Jonathan Sarfati, Dr. Jeffrey Tomkins, and others credentialed in scientific disciplines. They cover six lessons that tie into the free short videos on the Website. There are several illustrations, many of which are in color. If anti-creationist sidewinders want to call this a pack of lies (it happens), they'll have to slap leather with not only the reasoned evidence, but also about 500 references given at the end. These are followed with supplemental topics and Dr. Biddle's testimony, "Coming to Belief in Genesis as History". After those, some helpful resources and a direct salvation message. The book is supplemented with another free PDF download, a guide for students and facilitators. This has fill-in-the-blank questions, discussion questions, applications, and additional supplements. Although targeted for Christian students in the public education indoctrination system, I strongly feel that anyone who has received a reasonable amount of science education can benefit. In addition, seems to me that homeschoolers can benefit from this. There are people who sincerely want to know why evolution is untenable and what creation science has to offer. (They may be a bit put off by the title, Debunking Evolution Taught in Public Schools, but as I explained above, they are not the target audience.) This book, guide, and related videos would also be very helpful for people who are creationists but want to get more into the science. There is additional material on the Website, including a DVD on the above books and videos, a variety of textbooks are discussed, "Fast Facts", other informative videos, and free online courses for Debunking Evolution. There is also an in-depth creation worldview class that has a fee, and it appears that they have three more planned. I may even take that first available class myself! A side note from me to creationist students in public schools: don't get uppity. Sure, you have the truth and they have stories, not evidence. But if you aren't respectful and get mouthy, you can put a burr under the teacher's saddle and regret it. You may want to follow the suggestions in "Four steps for surviving evolution classes at high school". There is one minor grievance that I have. Genesis Apologetics uses the excellent resources from Answers In Genesis and the Institute for Creation Research, I would like to see them include material from Creation Ministries International as well. That would be fitting, since Dr. Sarfati from CMI wrote one of the chapters. However, the three ministries listed just above as well as some others are included in the resources section of the book. A caution is in order: science changes, so keep up to date. New information comes to light, theories change. I recommend searching out the three organizations listed above as well as the others in the resources list. Here's a helpful hint for using Google, and that's to search a site that may be slow or less than helpful in its internal search engine by putting in a Google search, say, "piltdown man site:icr.org". Do it the way you see it here, but leave off the quote marks unless you use them before the "site" command. Although I have written this review several weeks before I scheduled it to publish, I delayed it so that it would be closer to "back to school" time in the United States. Unfortunately, that varies widely, with some schools commencing in early August and others waiting until after Labor Day. Parents, students, and others can decide to use the material here as preventive maintenance or to get into it when school is in session. Whatever you choose to do, I hope that you will give the material available at Genesis Apologetics some serious consideration.